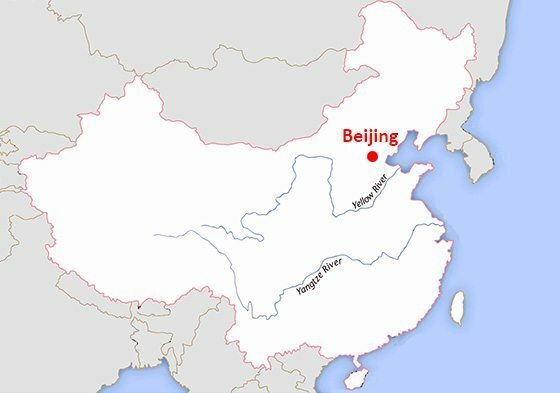 Beijing, one of the six ancient cities of China, boasts an impressive history, profound cultural attractions, and captivating scenery, which mesmerizes countless visitors annually. Take a walk on the immense and historic Great Wall and have a birds-eye view of its winding path through the rolling hills. 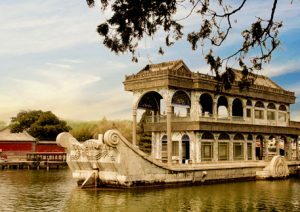 Visit the overwhelming Forbidden City and appreciate China’s vaunted imperial past. 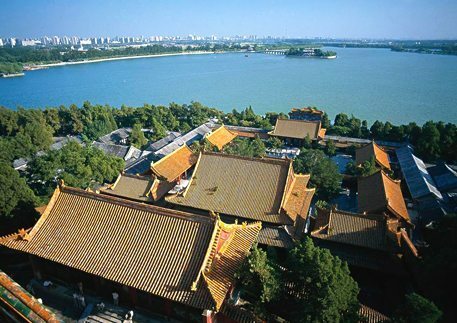 Take the time to indulge in the breathtaking Summer Palace and experience the daily life of people in the Hutong area by rickshaw. Treat yourself with the terrific Kongfu Show after enjoying an authentic Peking Duck Banquet. Shop on the world-famous Wangfujing Street and stroll around the Tiananmen Square. No matter what you’re looking to do, Beijing has something for you! Because of Beijing’s popularity, we offer several affordable tour packages of this remarkable city. 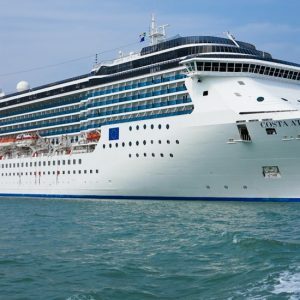 Call us to book your tour or create one of your own! 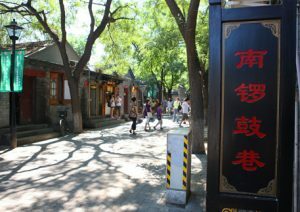 Nanluogu Lane is the most diverse hutong (neighborhood) in Beijing. At half a mile (800 meters) long, Nanluogu Lane is the best-preserved hutong of the Yuan Dynasty (1206 CE-1368 CE). At night, people hustle through this hutong area, and on both sides of lane stand various kinds of shops and snack booths. This is also the third most famous street after Sanlitun and Shichahai streets in Beijing when it comes to offering various types of beer. It is very enjoyable to roam in the boutiques and souvenir shops and enjoy a taste of Beijing-style snacks. How to get there: Bus No.107, 124, 635 to Baochao Hutong Stop or bus No.118, 13, 823, 850 to Luoguo Lane Stop. 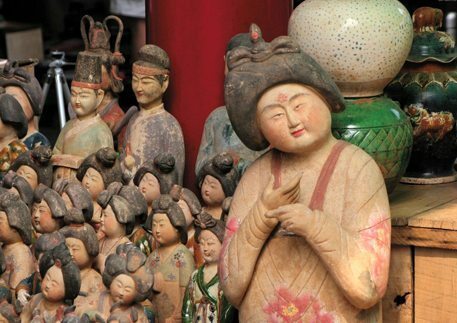 Panjiayuan Flea Market is a famous flea market which sells antiques and other handicrafts. About 60,000 to 70,000 people visit the market every weekend and even foreign dignitaries such as Hillary Clinton have strolled through here. In the past, real curiosities could be found here, though today it is harder to find a real antique. 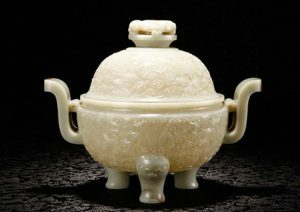 It still attracts many antique lovers to show off their respective “treasures”. You can not only purchase various types of beautiful handicrafts but also explore real Beijing trough the old stuff and stories. Location: the southwest of Panjiayuan Bridge, South road of East third ring road, Chaoyang District. 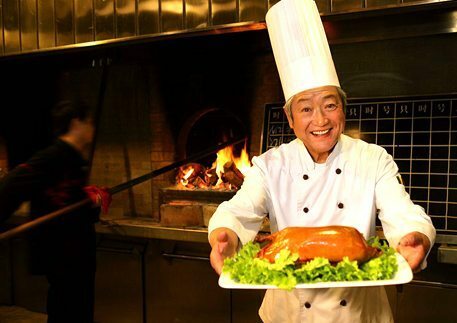 Beijing Duck is divided into two types according to cooking methods. After being slaughtered, eviscerated and rinsed in water, the ducks are then soaked in boiling water for a short time before they are hung up to dry. During hanging, maltose syrup is smeared on the surface of the ducks. After hanging for 24 hours, the ducks are roasted in an oven. 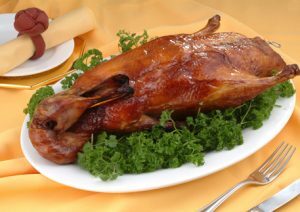 The traditional way is to roast ducks in either closed oven or hung oven till the meat is slowly cooked. Pianyifang Restaurant is also well known for its Beijing duck. One of the best places to enjoy this kind of duck is Quanjude Restaurant. If you want to experience the old Beijing and Beijingers’ lifestyle, you should visit the different Hutongs. A Hutong is simply a small street or alley in China established back in the days of the Mongolian Yuan Dynasty that today are representative of the local culture. 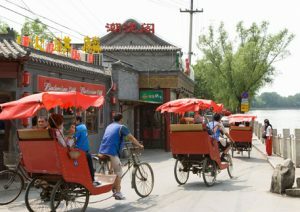 Rickshaw drivers provide tours through Hutongs, but a better and less expensive way to do so is to rent a bike, which are typically easy to find. Beijing is one of the most popular tourist destinations in China, indeed, the world. It also houses numerous attractions that can’t be found anywhere else. 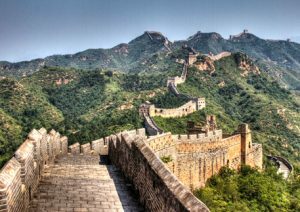 While there are an abundance of things to see, the Great Wall and Forbidden City, of course, are on the list. Chairman Mao Zedong once said that he who doesn’t reach the Great Wall is not a true man. This famous saying encourages numerous tourists and Chinese nationals to climb Great Wall. 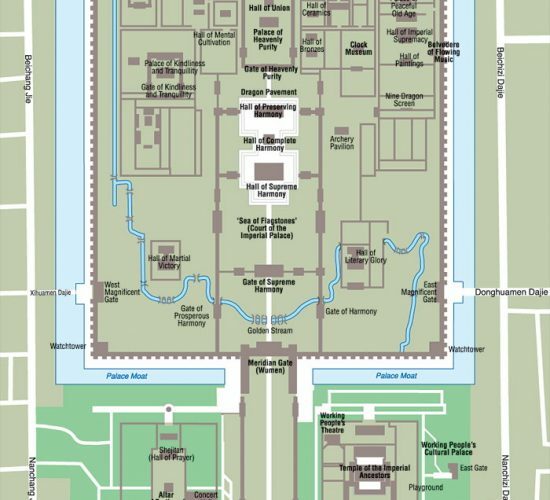 The Forbidden City, the Chinese imperial palace from the Ming Dynasty, houses extensive collections of artworks and artifacts among other treasures. Besides these two sights, some other spots like the Ming Tombs, Tiananmen Square, Summer Palace and Temple of Heaven are highlight that deserve inclusion in your trip. The best months to visit Beijing are May, June, September and October. However, in May and October, you should remember to avoid the national festivals like May Day (May 1) and National Day (October 1) which can last up to seven days. Beijing will be very crowded with domestic tourists during these two holidays. Spring in Beijing generally begins in April when, the weather may change unexpectedly and sometimes sand storms may even happen. In May, it is warm and comfortable for visitors. Summer is not very long but it is hot, as is most of China at this time. Autumn is a comfortable season when the leaves begin to turn yellow. Without the disturbance of summer heat and winter coldness, you can climb the Fragrant Hill and enjoy the beauty of red maple leaves. 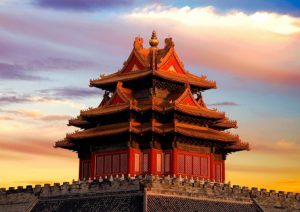 Beijing Attraction lists you the most-visited and must-see Beijing tourist attractions like Great Wall, Forbidden City, Summer Palace and much more. 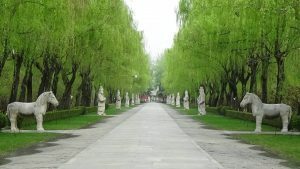 In addition, other information about these Beijing attractions, such as which ones charge an admission fee and opening time, are also provided. 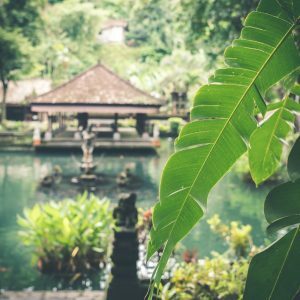 An amazing tour of beautiful, tropical Singapore and Bali, home of some of the world's oldest cultural treasures as well as the epicenter burgeoning global markets. Beijing enjoys the reputation of being a historical and cultural capital in China. 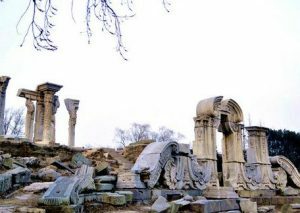 As the capital of five dynasties, Beijing preserves a large number of important artifacts in the imperial palace, imperial gardens, temples and ancient tombs which are all symbolic of a cultural city. Undoubtedly, Beijing is the culture hub of China. The Forbidden City, the imperial palace of Ming and Qing dynasties, superbly displays traditional Chinese styles in architecture. 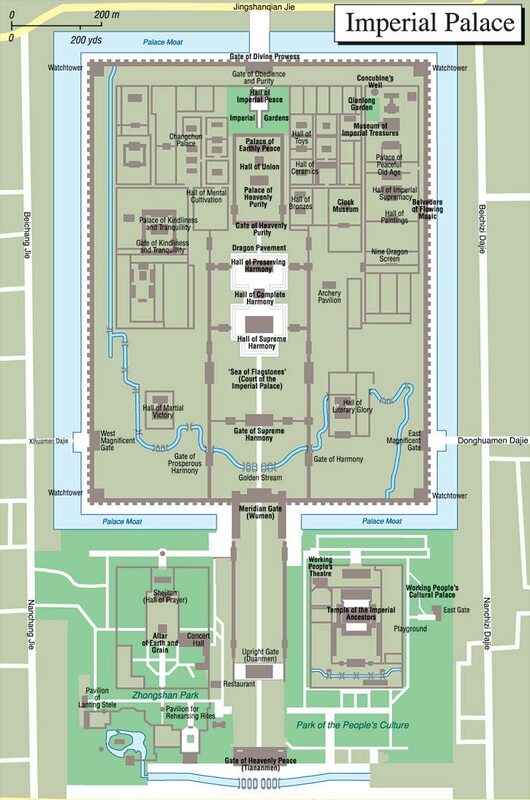 The Ming Tombs is the biggest imperial mausoleum in Beijing. Beijing culture can also be represented by other elements such as its unique dialect, opera and cuisine besides the ancient buildings. Beijing enjoys the reputation of time-honored historical and cultural city in China. As the capital of five dynasties, Beijing preserves a large number of imperial palace, imperial gardens, temples and ancient tombs which are symbols of a cultural city. Undoubtedly, Beijing is the culture hub of China. Forbidden City, the imperial palace of Ming and Qing dynasties, well displays the traditional Chinese styles in architecture. 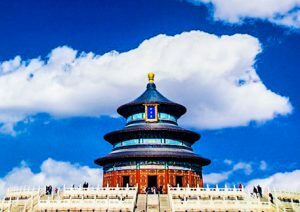 Temple of Heaven is world-famous for its logical layout and delicate structure. China is a country with the religious freedom and respect. As the capital of China, Beijing has many temples including Taoism, Buddhism, Tibetan Buddhism and Islam temples, and Christian and Catholic churches. 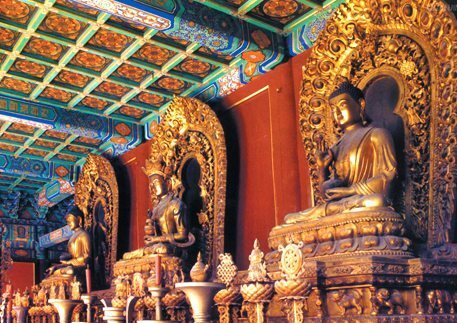 The famous Buddhist temples like Tanzhe Temple have become the hot tourist destinations. As for Taoist temples, Baiyun Temple is the best representative which is the popular destination for pilgrim not very touristy. Yonghe Lama Temple is one of the largest and most important Tibetan Buddhist temples in the world. One of Catholic churches is located in the area of Wangfujing. Some Christian churches can also be found in Beijing. Beijing dialect, is a dialect of Mandarin spoken in the area of Beijing and then became the basis of Standard Chinese, the official language of China. Beijing dialect is very similar with standard Chinese, but it is very easy to distinguish whether an individual is a native of Beijing speaking or an individual of standard Chinese. 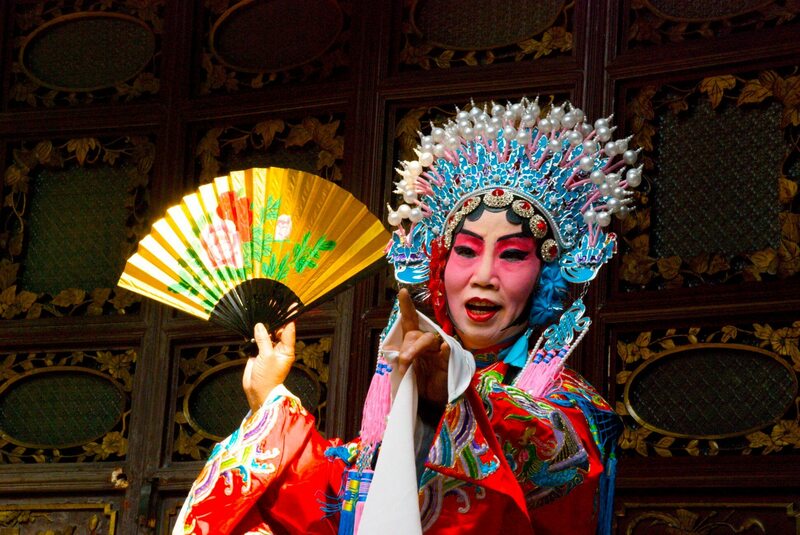 Beijing Opera or Peking opera is very favored by Beijing locals. It is a form of traditional Chinese theatre. Beijing Opera can originate from the several ancient operas in China. In 1790, ‘Four Great Anhui Troupes’ brought Anhui Opera to Beijing. The performance of Anhui Opera make a hit and ‘Four Great Anhui Troupes’ performed with Hubei troupes in 1826. The combination gradually formed into Beijing Opera. Now Beijing Opera is the national theatre style. Beijing Cuisine is characterized by cooking different muttony and porky dishes. In Ming and Qing dynasties, the most imperial cooks were from Shangdong province so that some elements of Shandong cuisine integrated into Beijing cuisine. It was also combined with flavors of other cuisines like Tanjia cuisine, Islamic food and Manchu style. Beijing Duck is an iconic Beijing dish which is tasted by almost every tourist when they visit Beijing. Hutongs are a kind of narrow alleys formed by lines of siheyuan, traditional courtyard dwellings. Hutongs originated from Yuan Dynasty. According to investigation, the oldest Hutong is Sanmiaojie Hutong with history of 900 years. Dongxi Jiaomin Hutong is the longest with length of 3,250 meters. The shortest one is Qianshi Hutong only with length of 0.7 meter. Beside its numerous historical attractions, Beijing is also a culinary destination for many, where authentic Beijing specialties like Roasted Duck, imperial court food and local snacks are easily available. Walk on the Wangfujing Snack Street and tasted the mouth-watering Shredded Potatos, Rolling Donkey, Tuckahoe Pie, Noodles With Soybean Paste and Palace Chicken Cubes, refreshments and the likes. 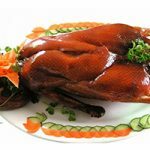 Dine in the local-famous Qianmen Quanjude Roast Duck Restaurant, Fangshan Restaurant, Shanshuijian Restaurant, Ritan Restaurant and Hancang Restaurant, where these featured specialties can be enjoyed. 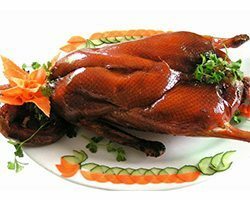 Peking Duck or Beijing Duck is best-known for the thin and crispy skin and rich taste. The culinary tradition of Pecking duck can be dated back to the Yuan dynasty when it was a dish of the imperial court. The authentic versions of this dish should be served with copious amounts of skin and little meat. 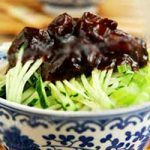 Generally it is eaten with pancakes, sweet bean sauce and scallions. The sweet bean sauce is smeared on the pancakes, then slices of meat are put between the pancakes. Imperial Court Food or Fangshan is the food of the emperors of old. 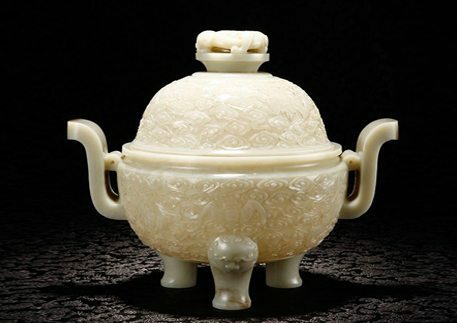 After downfall of Qing Dynasty, the imperial cooks began to run the restaurants and the dishes they cooked were very reminiscent of imperial court food. Fangshan features ingredients and special presentations including beautiful vegetable carvings. 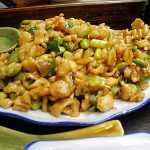 Zhajiangmian is a very popular dish in the north of China. 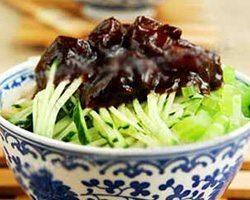 Beijing Zhanjiangmian stands out compared with other places” it is composed of pork, handmade noodles, vegetables and soy sauce. 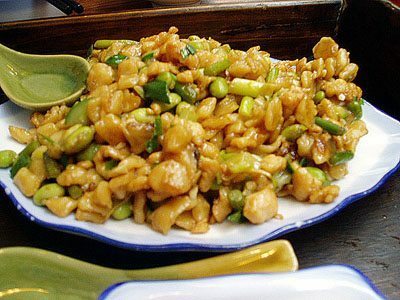 The deliciousness of Zhajiangmian lies in the zhajiang which is salty fermented soybean paste stir-fried with ground pork. Depending to the season, the various vegetables are also served in the noodles. For Beijingers especially the older residents, they are fond of hot noodles in winter or cold noodles in summer. Getting a taste of authentic Zhangjiangmian is a must for tourists in Beijing. Fried Dough Drops are a special local snack in Beijing. The Fried Dough Drop is characterized by a unique flavor and fragrance. It was created by a mother and her daughter who ran a restaurant named Fuangfu near Peach Arch. During the process of cooking, wheat flour, beef, fresh vegetables and other ingredients are used. As one of Beijing’s most popular local snacks, Fried Liver is cooked with pork liver and intestines with garlic, starch,soy, garlic, bone soup and other ingredients. So Fried Liver is actually not greasy but lighter fare. 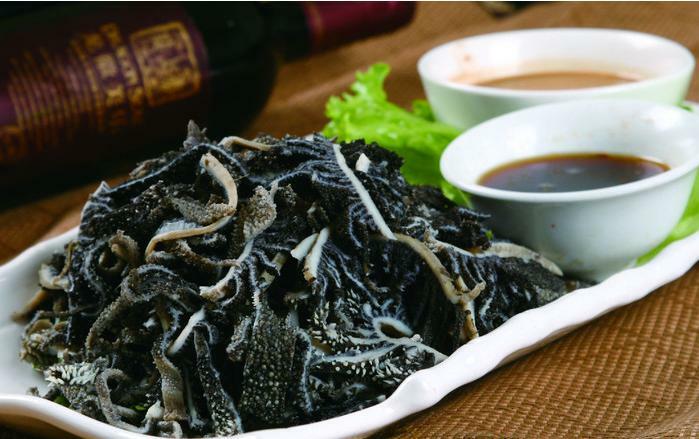 The dish evolved from “Fried Lung” during the Song Dynasty (960 CE-1279 CE). In earlier times, it was eaten with Baozi (steamed stuffed bun) as a breakfast. But now, Fried Liver is eaten at any time of the day and with any other food. Quick-Fried Tripe is a famous Beijing local snack, which is an Islamic snack. The tripes of cattle or sheep are cut into slices or stripes and put into boiling water. After it is cooked, the tripes are stirred with sesame sauce, soy sauce, vinegar, pepper oil, and scallion. Then, Quick-Fried Tripe is ready for you. Filled Sausage is a special snack in Beijing. It is made from pork intestine filled with starch and minced meat. After being steamed, filled sausages are fried and then diced. When eating, the salt and garlic juice are added. It is said that Empress Dowager Ci Xi once taste filled sausage and spoke highly of it. Fuxingju, the earliest restaurant to sell filled sausages, specialized in making filled sausage and offer the sausages as tribute to royal family of Qing Dynasty(1636- 1912). Lvdagun is a very traditional snack in Beijing. 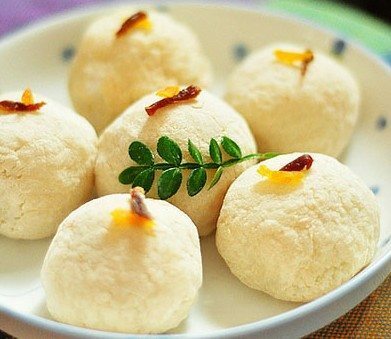 It is made from millet flour or sticky rice stuffed with red bean paste. And then the formed Lvdagun is trundled in sesames. 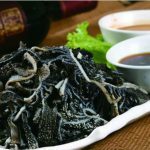 It originated in Chengde and became popular after introducing into Beijing because Manchu were fond of sticky food. Lvdagun is characterized by fragrant, glutinious and sweet. Aiwowo is a traditional Islamic snack made from sticky rice, saugar, sesame seeds, peach kernels. The history of Aiwowo can be dated back to early Ming Dynasty. In the ancient times, the snack shops provided Aiwowo from Spring Festival until the early autumn. Now, it can be eaten at any time in a year. With rich nutrition, Aiwowo are good for those who have a poor appetite and weak body. Wangfujing Snack Street is located at the south side of Friend World Mall. Wangfujing Snack Street collects the famous snacks from Beijing and other places in China. Here you can also find the equisite souvenirs and folk handicrafts. 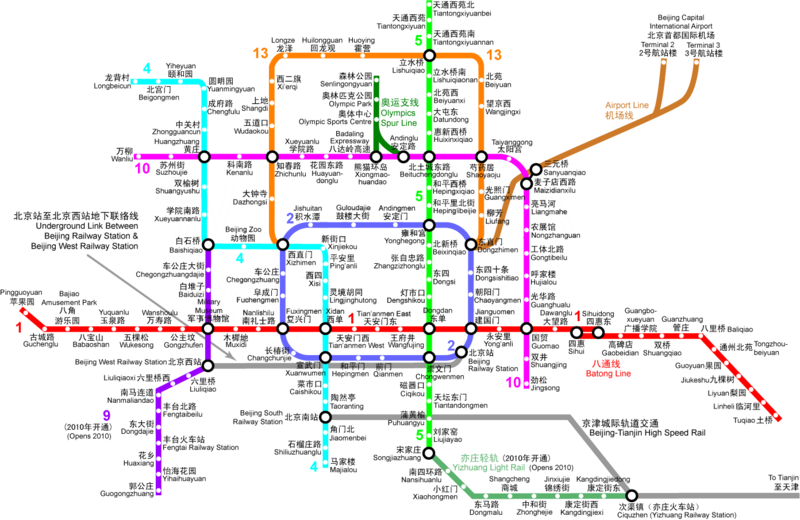 Location: To the west of Wangfujing Street, Dongcheng District How to Get to: Metro Line 1 to Wangfujing Stop or take bus No.20, 37, 41, 59, 103, 104, 120, 420, 802. Guang’anmen Food Street are created with the reconstruction of the south Beijing. This street features the hot food. During the dinner time, nearly every restaurants are crowded with customers. There are also some time-honored restaurants here. Location: Guang’anmennei Street, Xuanwu District How to Get to: Metro Line 2 to Peach Arch or bus No.14, 66, 102, 105 to the Luhufang Bridge West Stop. Located in the commercial area, Xiaoyun Road Food Street houses many restaurants in different styles and sizes. Foreign food preponderates and those foreign food and its atmosphere attract people to eat here. Location: Xiaoyun Road, Chaoyang District. How to Get to: Bus No.516, 659, 682, 708 to Lulaiti Huahui Stop. Qianmen Food Street houses many time-honored restaurants where you can eat authentic Beijing cuisine and local snacks. Although it is not as popular as other food streets in Beijing, the food here represts food culture of Beijing. It is also the place where foreigners must go. There are Quanjude Peking Duck Restaurant, Laozhengxing Restaurant and other famous restaurants with history of over 100 years. Location: Qianmen Street, Xuanwu District How to Get to: Bus No.1, 2, 4, 5, 9, 10, 20 to Tiananmen Stop or Qianmen Stop or Metro Line 1 to Tiananmen East Stop and Line 2 to Qianmen Stop. Besides attractions and food, Beijing is also home to different branded goods and various delicately-designed souvenirs, which makes it a great getaway for kaleidoscopical shopping. In Xiushui Street, Wangfujing Commercial Street, Liulichang Street, Panjiayuan Antique Market, Xidan Commercial District, such must-haves like palace lantern, cloisonné, Fresh water pearls, dough shaping, jade ware, carved Lacquerware, snuff bottles, antique furniture, well-preserved fruit are all available. Besides attractions and food, Beijing is also home to different goods and various delicately designed souvenirs, which makes it a great getaway for shopping. In Xiushui Street, Wangfujing Commercial Street, Liulichang Street, Panjiayuan Antique Market, Xidan Commercial District, such must-haves like palace lanterns, cloisonné, Fresh water pearls, dough shaping, jade ware, carved lacquer-ware, snuff bottles, antique furniture, well-preserved fruit and more are all available. Cloisonné is also called enamel. The oldest cloisonné originated during the Yuan Dynasty (1206 CE-1370 CE) and was commonplace during the reign of Emperor Jingtai of the Ming Dynasty (1368-1644). With a history of about 1,000 years, cloisonné is made from red copper, and then thin copper wire is used to decorate the body. After that, beautiful enamel materials are filled. In the ancient time, cloisonné was just used by royalty and aristocrats so that it was the symbol of power and social position. How to get to: Take Bus No.7 and 986 to Anlelin Stop. There are two types of lacquer-ware. One is carved lacquer-ware and the other is gold filigree lacquer-ware. 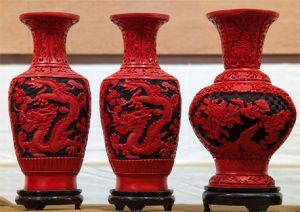 The art of carved lacquer-ware was formed in the 14th century. With beautiful carvings and exquisite shapes, the carved lacquer-ware such as chairs, screens and vases is important category of handicraft. Gold filigree lacquer ware is made of gold and silver inlaid with jewelry. Beijing dough toys originated in folk society. 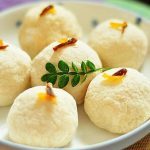 It is made of flour and sticks of rice flour. Artists pinch the basic shapes of people or animals and then carve on the shapes with a bamboo knife. The dough toys are small in shape and convenient to carry. Beijing dough toys are one of best souvenirs to gift to family members and friends. The art form of inner-painted snuff bottles developed during the late Qing Dynasty. The pictures and calligraphy are painted on the inside surface of the bottles. When producing inner-painted snuff bottles, a tiny paint brush through the neck of the bottle is used to paint the elegant picture and make precise strokes backwards by artists. 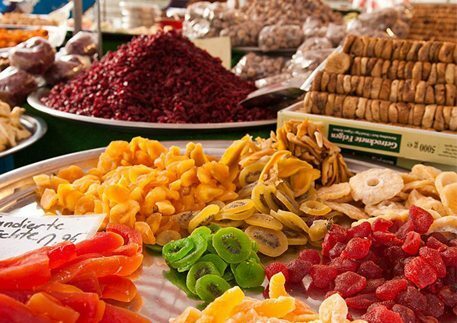 If you are a candy-lover, you should have a taste of Beijing candy. Beijing crunchy candy is one of top three kinds of candies in China in terms of popularity. Beijing preserved fruits are a typical local product found in many regions of China. In ancient time, the imperial cook preserved fresh fruits in honey or sugar for emperor and then the method of making preserved fruits spread to the folk society. The preserved fruit maintained in honey is called honey glazed fruit and in sugar is preserved fruit. Covering an area of 7 acres (28,000 square meters), Xiushui Street is a shopping place to sell shoes, bags, famous brand clothes, fashionable clothes and handicrafts. The fun of the street lies in haggling with vendors. Buyer beware: the price on the tag is not final. You can bargain with the shopkeepers at about 30 percent of the price on the tag. The more you haggle, the less money you may pay in the end. Bargaining is a rule here. Location: No.8, Xiushui East Street, Chaoyang District. Wangfujing Street with length of about 1,000 meters is considered “the first street” in China. On the both sides of the street stand miscellaneous stores and malls. 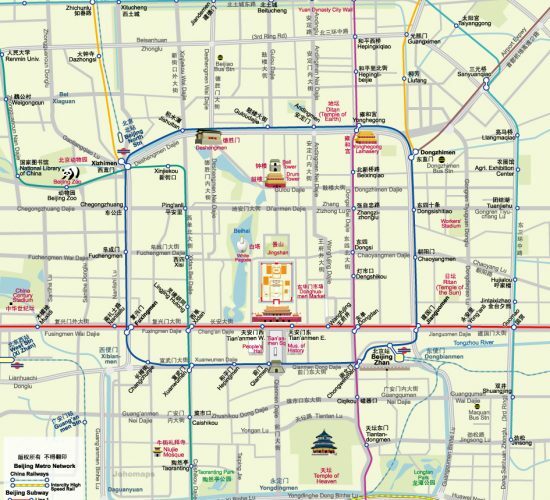 It starts from Wangfujing south entrance where the Oriental Plaza and Beijing Hotel can be found and ends north at Wangfujing Subway Station. There are many famous brand shops, department stores and souvenir shops on this street. Although Wangfujing is not a hot destination, it is the most-visited and must-see shopping place for tourists. 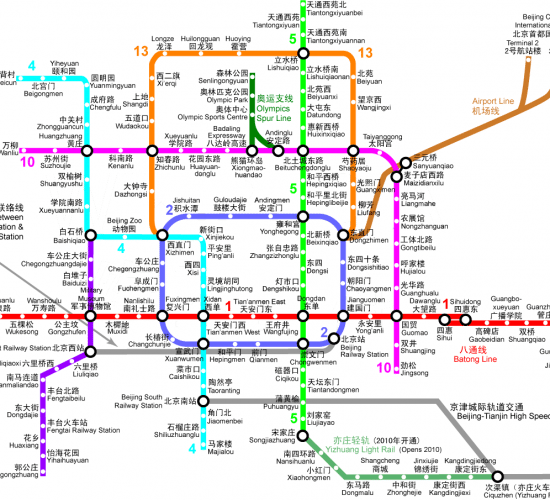 Location: In Dongcheng District How to get to: Take metro line 1 to Wangfujing Station or take taxi. Qianmen Street is the famous commercial street along the Beijing central axis. There are several popular stores and restaurants here like Pianyifang Duck Restaurant, Quanjude, Lao She Teahouse, Tong Ren and so on. Pianyifang and Quanjude are two best restaurants to try Beijing Duck. Lao She Teahouse, situated at the west of Qianmen Street, is the perfect place to enjoy tea and watch traditional shows. The must-see attraction on the street is Guanghe Tower which was built during the late Ming Dynasty and was the earliest theater stage. It was said that Emperor Kangxi once watched opera here. 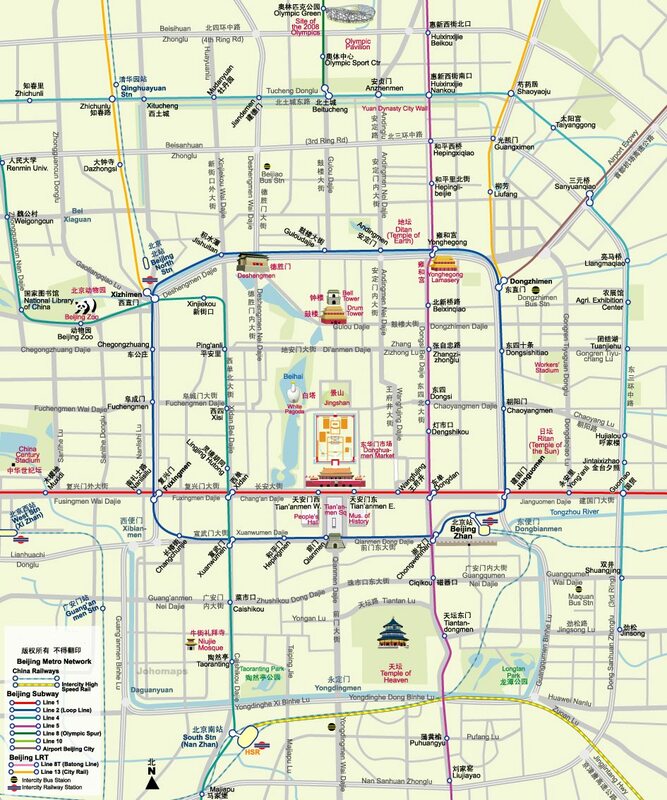 Location: From Zhengyang Gate in the north to Tiantan Road in the south How to get to: Take Bus No.17, 22 and 120 or metro line 2 to Qianmen Stop.